The Complete Beginner’s Guide to Binance Review 2019 - Is it Safe? At this time, the digital currency exchange market is filled with a wide variety of choices, therefore choosing the right exchange or trading platform can be quite a headache for both novice and veteran cryptocurrency users. Binance is a popular cryptocurrency exchange which was started in China but recently moved their headquarters to the crypto-friendly Island of Malta in the EU. Binance is popular for its crypto to crypto exchange services. While the company is still fairly new on the market ( it launched last year ), it has managed to gain a lot of popularity thanks to its impressive number of Initial Coin Offering listings, professional attitude and friendly CEO and also due to its low trading fees. In our review, we will attempt to outline everything that you must know about Binance, including how it works, the crypto pairs that you can exchange, trading fees/limits, security aspects, and customer support. Those who visit Binance for the first time will quickly notice that the platform offers two options for digital currency trading- basic and advanced. Neither the basic, nor the advanced versions are bound to be easy to use for complete beginners. However, anyone with a background in digital currencies and with a bit of knowledge into how exchanges work should be able to use the platform and its different services. The main difference between the basic and the advanced version is that the advanced one offers more-in-depth technical analysis of digital currency value over time. At this time, the dashboard for the basic version offers several graphs and charts for the pairs that you’re trading, order books, and trade history. The Basic view is nicely designed and well laid out, all the information you need is clearly presented with prices on the left, graphs in the center along with the buy and sell boxes and the trade history is presented on the right so you can quickly see what the latest trade prices were. The advanced view uses a dark theme and makes the trading charts larger and the latest trade prices are displayed on the right with the buy sell boxes underneath. Which you choose is a matter of preference really, I like the lighter colored basic view and find the layout a little easier to use. To use the exchange, users will first have to create an account. The process behind this is fairly simple and straight-forward and you don’t have to verify your account for level 1 which is a 2BTC daily withdrawal limit. For level 2 which allows up to 100BTC per day, you need to upload a photo ID and wait till you are approved. There are higher limits still, but you will need to contact them directly to arrange that. Time for verification can vary depending on how busy the site support staff are, so make sure to plan ahead if you wish to withdraw larger amounts and make sure this step is complete before depositing and trading large sums on the exchange. Now, that this is out of the way, users can go ahead and fund their Binance account. While you can choose from a multitude of digital currencies, it is recommended that you stick with either BTC or ETH. To fund your account visit the “Funds” > “Deposits / Withdrawals” link at the top of the site and find the currency you wish to send, then click the “Deposit” button next to it which will then you give you the wallet address. You can then send your funds to this address to begin trading on the platform, depending on which currency you deposit it will take different times to show up as this is reliant on that currencies blockchain. Some currencies like Ethereum are faster than Bitcoin which can take a while. Now that your account is funded, you can simply start trading, exchanging and investing in various digital currency pairs. Binance offers plenty of choices, as they support all major digital currencies, but also numerous ICO listings and their respective tokens. At this time, the platform can only be used to generate limit and market orders. This has been considered a disadvantage by some, as many expected trading options that would be more advanced. Following the placement of your order, simply wait for it to be fulfilled according to the terms that have been set. Trading on Binance is fairly straight-forward if you have used any other cryptocurrency exchange before. To get started, make sure you have deposited some funds – there are options for trading pairs in BTC, ETH, BNB and USDT. Once you have your funds, at the top right menu, select “Exchange” > “Basic” or “Advanced” to load the trading screen. We will be using the Basic view. On the right hand side, of the screen select a tab from BTC, ETH, BNB or USDT this is what you will be trading in. Then choose your desired currency from the list. You can also search here and you can create a favorites list by clicking the star next to any currencies. Once your desired currency has loaded, take note of the left-hand column which shows prices that people are willing to sell at in the top half in red and prices people are willing to buy at in green in the bottom half. The number in the middle shows the last sale price. Now to place a buy order, use the center box underneath the graphs and you will see the buy box is in green on the right. You can manually enter a price you wish to purchase at, but a better way is to click a number on the left-hand column. You can then enter the amount of the currency you wish to buy or click the 25%, 50%, 75% or 100% buttons which will fill it with an amount based on how much of the buying currency you have ( in this case BTC ). Once your order is placed it will be show underneath in the “Open Orders” section until it is filled. At that point your new currency will be available under the “Deposits / Withdrawals” menu where you can withdraw it to the wallet of your choice. Binance has often been praised for its wide variety of support coins. Traders can use the platform for multiple digital currencies, including, but not limited to Bitcoin, Bitcoin Cash, Bitcoin Gold, Ethereum, Ethereum Classic, EOS, Dash, LiteCoin, NEO, GAS, Zcash, Dash, Ripple and more. As mentioned before, Binance also supports numerous tokens, as part of ICO listings. With this in mind, traders can use the platform to trade these tokens for a profit as well. Binance is currently very quick to add new coins and tokens after their ICO which usually means you can purchase them cheaply which allows for greater profit down the road. They currently offer trading pairs in BTC, BNB, ETH and USDT. Another thing to note is the Binance Coin, which was issued during their own ICO. The Binance coin can be used to pay fees and it will also feature in their future plans to create a Decentralized Exchange where it will form one of the key base currencies. Purchasing the Binance coin itself looks like a good investment for the future as the exchange plans to use their profits to buy back a portion of the coins every quarter and destroy them: hence decreasing the supply and making them more valuable for holders. If you’d like to read more about the BNB Coin, check out our indepth guide. 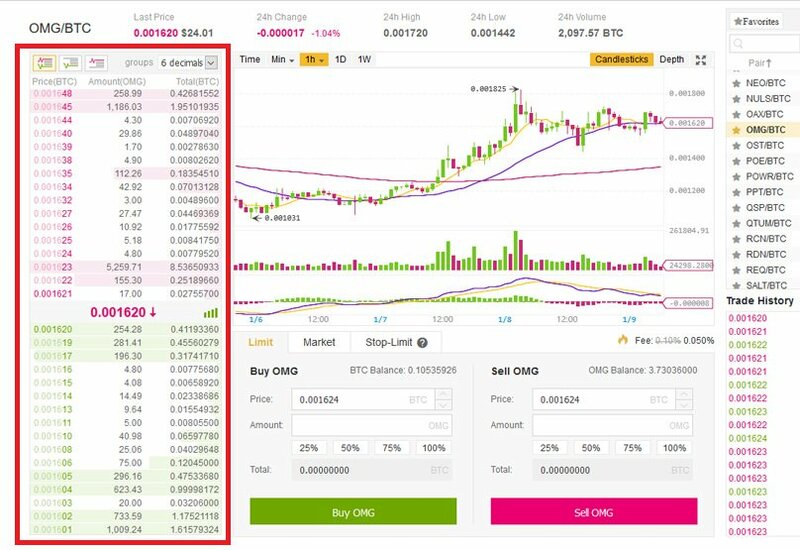 At the time of writing, Binance charges an average fee of 0.1% on each trade that a user makes. Those who choose to pay via the Binance token can get a 50% discount on the trading fee, which is absolutely great news. These are surely some of the lowest fees available at this time. When it comes down to transfer limits, there is no limit on the number of coins that you can deposit. However, without getting verified, users are limited in terms of how much they can withdraw. Verification will establish you as a level two users, thus lifting these limits and providing a lot more freedom when using the platform. The verification process requires users to provide Binance with their full name, country, gender, a photo of passport/government-issued ID, and even a selfie with the passport. A unique feature of Binance you will notice is that they regularly hold competitions with some amazing prizes. Some examples of competitions in the past include Waves and Tron. The waves competition gave away 20,000 Waves to Traders based on how many trades they have made of this currency. The other competition for Tron (TRX) gave participants the chance to win a Maserati car, Mercedes Benz car, a Macbook Pro or a iPhone X. Again, the winners were the people with the highest trading volume of this currency. The current rankings show that the person in first place had over 358 BTC volume in trades so you will need to be a whale to be in with a chance of winning first prize. There are other regular competitions though, so keep an eye on the site for your chance to enter. While Binance is one of the newest cryptocurrency exchanges available on the market, it has quickly managed to attain a high level of trust from its users and the digital currency community. However, the exchange fails to provide users with enough information on how the funds are being secured, yet we like to believe that security is taken seriously. Two-factor authentication is available and is always a nice sight. It is however known that the platform offers a multi-tier and multi-tier system architecture. Update: In March 2018 Binance suffered a hacking attempt. The hackers tried to pull off an audacious move which was luckily caught by the automated systems in place at the exchange. For months the hackers had been accumulating people’s logins via a phishing website and secretly installing API access on the affected accounts. They then struck, converting all the victims altcoins to BTC and purchasing Viacoin, pumping the coin to a huge price and then selling their own supply of Viacoin at the high point, before trying to withdraw the BTC to their own wallets. Luckily no one lost funds as the hack was caught and the only people to lose out were the hackers, whose funds will be donated to charity. As this hack was made possible by people entering their site logins and 2FA details into a fake website, you should always make sure you are on the correct Binance url before logging in. We recommend you bookmark the site and only use that to access it, never click links from emails, Twitter, Telegram etc. This event has done a lot to instill confidence around Binance, not only did their automated processes catch the attempted hack before anyone lost any funds, they have since offered a $250,000 bounty to anyone who can help catch the hackers. Throughout this event, Binance acted exemplary and have been praised for their swift action in resolving this. For an exchange to be successful, it requires a great customer support team, capable of answering all user questions and requests in a timely manner. While the support area on Binance could use a little work, the team is responsive and capable of offering professional aid to traders in need. Support tickets are submitted via an online form featured on the website, and responses are made via email. There is currently no live chat support, nor a phone number where customers can get in touch with the support team. Other than the CS team, Binance offers a couple of FAQs and articles meant to help users get accustomed to the exchange and the way it works. It should be noted that customer support on Binance has been known to be slow to respond to customer requests. This is a familiar phenomenon with most of large exchanges and is due simply to the volume of users and amount of support staff. The exchanges have grown at an explosive rate this past year and the companies simply haven’t been able to keep up with demand. Binance grew fast especially, going from launch to the largest exchange on the planet in a few short months. Support staff for exchanges have to be carefully vetted and trained due to the technicalities and security requirements involved – unlike other traditional companies where staff can be trained quicker. Some things to bare in mind are double-checking wallet addresses, make sure you are sending the correct cryptocurrency to it’s corresponding address on the site. Mixups with wallets are one of the biggest mistakes people make when using exchanges. Other things to note are, try a smaller test payment first if you plan to transfer large sums – it may cost you a little more in fees but will be worth it for peace of mind. If you do need to contact support, make sure you provide them with enough information to be able to help you first time. Include wallet addresses, times of transactions and any other information you think they might need to help speed up the process. After reviewing several different locations, the company decided to invest in the European nation due to its existing pro-blockchain legislation and the stability that it offers financial technology companies through its regulatory framework. This is good news for the company and they even received a warm welcome from the Prime Minister of Malta on Twitter. Binance also announced that they were in talks with Maltese banks with the goal of providing Fiat transactions, meaning they can offer an on-ramp for fiat to crypto transactions in future along with fiat trading pairs on the exchange. More good news for Binance, it seems as their profile and reputation within the industry continues to grow. The BNB digital asset, now an ERC-20 token, will migrate as the native token of that network and be used for paying the trading fees on the new exchange. More good news recently for Binance is that they are partnering with Neufund to build the world’s first Decentralized Stock Exchange. Alongside the Malta Stock Exchange, they are aiming to create a regulated and decentralized, global stock exchange for listing and trading tokenized securities alongside crypto-assets. According to CapLinked, the market cap of equity tokens alone is projected to reach $1 trillion by 2020 and thanks to the partnership with MSX, a subsidiary of the Malta Stock Exchange and Binance, Neufund will become the first end-to-end primary issuance platform for security tokens, in particular, equity tokens. It will secure ways for secondary trading of equity tokens and enable companies around the world to fundraise on Blockchain in a legal way while offering much-needed liquidity. This is more positive news for Binance as they aim to consolidate their position as the world’s number one Crypto Exchange. We have now carried out a full review of Binance Jersey, so take a look for more indepth details about the new platform. Customers who wish to trade in the support fiat currencies will need to carry our KYC procedures by uploading their ID documents such as passport and driving license. “Expanding the cryptocurrency exchange markets with fiat currencies in the European region is opening new economic opportunities for Europeans as well as freedom from looming Brexit uncertainty where the pound and euro are also in concern. 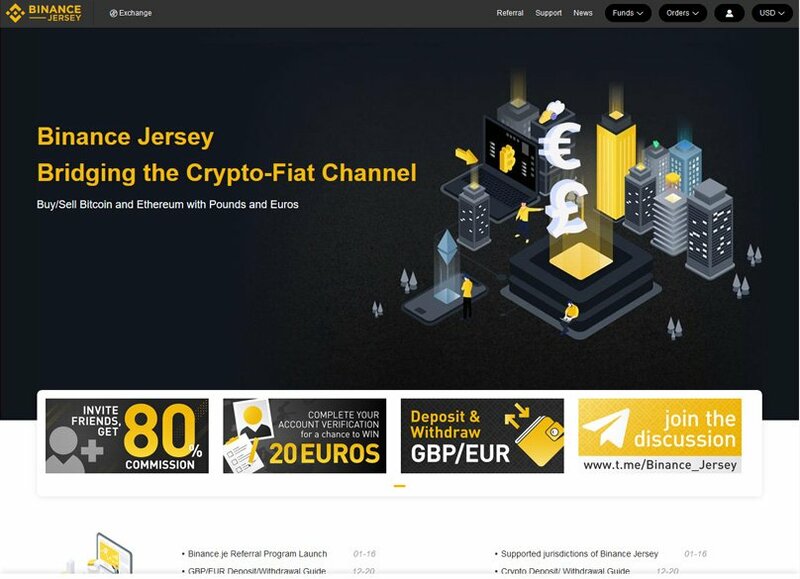 Through Binance Jersey, we want to help bridge the crypto-fiat channel for Europe and the U.K. as part of our global expansion to support broader cryptocurrency adoption”. To fund your account in fiat, you will first need to complete the KYC process, once that is done you can then deposit funds directly from your bank account by linking it from the Deposits screen. You can also fund your account with BTC or Ethereum. Once you have your account setup and bank account linked, you can also withdraw funds in fiat currency – this is great news as Binance is now able to offer a way for investors to cash out their cryptocurrencies. We have upgraded our review scores below and we feel this is a huge improvement to Binance’s Exchange offering, if they manage to roll this out to even more countries ( USA is currently excluded) it could be a game changer as people now have an extra, regulated fiat on and off ramp for their holdings. On March 20, 2019, Binance announced the launch of Binance Lite Australia, the continent’s first fiat gateway to the world of cryptocurrencies which provides a secure, reliable, and easy to use way to buy Bitcoin with cash in Australia. The cash-to-Bitcoin brokerage service operates via a network of over 1,000 newsagents across Australia, and currently allows anyone to buy Bitcoin using Australian Dollars (AUD), and there are plans to include additional digital currencies and fiat purchasing options in the future. Users must first undergo account verification on Binance Lite, and after being successfully verified, users can place online orders and deposit cash at their nearest newsagent, in order to receive their pre-ordered Bitcoin. 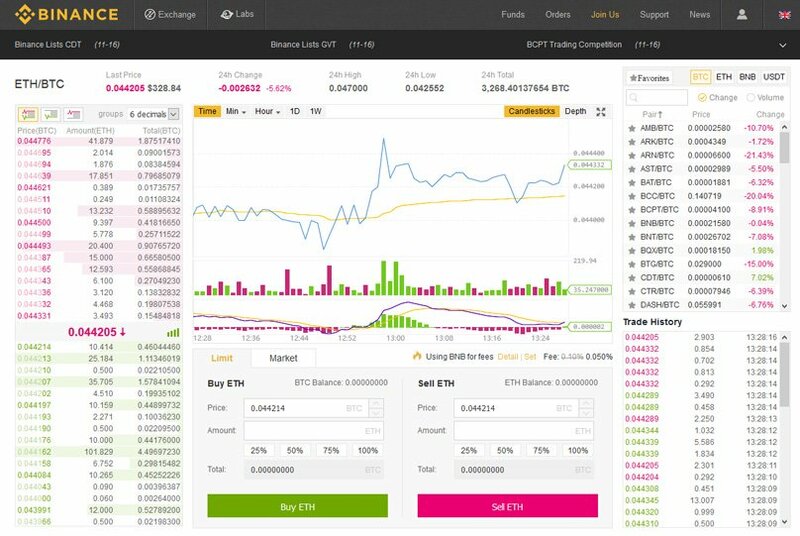 The Binance Lite brokerage service is operated by InvestbyBit, an independently operated subsidiary of the Binance.com cryptocurrency exchange. The service aims to simplify the process of purchasing cryptocurrencies and make digital assets such as Bitcoin readily accessible across Australia. Fees A 2.5% transaction fee (50% discount applied) plus GST on the transaction fee for each purchase is currently being charged as an introductory rate. Therefore, for a $50 order, the transaction fee will be $1.22 and the GST will be 10% of the transaction fee, which is $0.12. Limits The system is currently in its Beta phase, and the minimum purchase amount has been lowered to $30 with the maximum purchase amount capped at $1000. These limits may change over time and only multiples of $10 are being accepted, such as orders for $50, $60, $70 etc. First time customers are required to go through a one-time Know Your Customer (KYC) document verification. When using the service, it’s necessary to follow the instruction prompts after the order page and go through the verification. In order to complete the verification process, it’s necessary to submit 1 or 2 forms of government issued ID documents as a Passport, Driver’s Licence, or Medicare card, in addition to your residential address. Any returning customers, who have already completed KYC verification, will be sent to the order summary page directly after opening a new order. Each account is linked to a mobile number, and users should ensure to use the mobile number provided when first completing the verification process. Anyone choosing to use a new mobile number will be required to complete the ID verification process once again. In order to purchase the supported cryptocurrencies with a debit or credit card, users can first go through the official instructions page and then visit: https://www.binance.com/en/creditcard. Binance Launchpad is the exchange’s token launch platform that aims to connect blockchain projects with the greater cryptocurrency community and enable projects to raise funds while interacting with Binance’s significant user base. In December 2017, the BREAD and GIFTO projects were able to hold successful token sales on Binance Launchpad and projects such as BitTorrent and Fetch.AI have also held successful launches in 2019. The platform makes use of the exchange’s native BNB token and rewards users for holding the token as well as allowing it to be used to participate in token sales. Read: What is an IEO? The ability to part in token offerings continues to attract a significant amount of users to Binance and it’s necessary to go through a number of steps in order to get used to the Launchpad platform. Anyone interested in a project should first go to the Binance Launchpad website and click on the project page and thoroughly research any of the projects on offer. If not already done, it’s also necessary to complete your Binance account verification, as token sales are carried out in compliance with the regulatory requirements in supported user jurisdictions. Binance Launchpad operates a lottery system which sees that the number of lottery tickets you can claim being dependant on the amount of BNB tokens you hold in your Binance account over a 20-day period leading up to the day of the lottery, with a maximum of up to 5 tickets per eligible account. The 20 days leading up to the lottery draw date is represented by X below, and by example, 100 ≤ X < 200 means that your BNB balance over the entire 20-day period is kept at 100 BNB or more, but does not exceed or reach 200 BNB. A snapshot at 0:00 AM (UTC) each day records each user’s BNB balance, and should your BNB balance drop below the minimum balance required on any given day during the 20-day period, they will be put into the lower threshold. For example, if User A holds 301 BNB for 19 of the 20 days but their balance drops to 299 BNB on one day. They will move to the lower threshold and only be eligible to claim 2 lottery tickets. Before the actual lottery date, users are given a 24 hour period to select how many lottery tickets they wish to enter, with the maximum number based upon their BNB holdings over the previous 20 days. Here, if a user submits an entry of 5 tickets and 2 tickets end up winning, they are committed to pay for 2 ticket allocations (in BNB) for the tokens. Each lottery ticket has a unique number with multiple lottery ticket holders, obtaining tickets with consecutive numbers. For example, when claiming 5 tickets, the tickets may be numbered 100010, 100011, 100012, 100013 and 100014. Once the 24 hour period ends and all tickets have been fully issued, Binance begins to randomly select multi-digit numbers. These are matched against the tail digits of all issued tickets in order to determine the list of winners. The selection process continues until the maximum number of winners are matched, and the respective BNB is deducted from each winning user’s balance, as soon as they are deemed a winner. Binance announces the maximum number of potential lottery ticket winners, and the allocation amount corresponding to each winning ticket in advance. Currently, the matching engine of the exchange is capable of processing approximately 1.4 million orders each second, hence making it one of the fastest exchanges available on the market. Additionally, the exchange works on all forms of devices, including web, Android, WeChat, and HTML5. Non-English speakers will be happy to know that Binance offers multiple-language support in Chinese, English, Korean and Japanese. Based on everything that has been outlined so far, Binance is undoubtedly the leading Cryptocurrency Exchange and offers great fees and awesome digital currency support. As it reportedly has access to abundant resources and partners, chances are that Binance will continue to evolve and offer great digital currency exchange services to its clients. We are happy to recommend Binance and have added it to our list of the Best Cryptocurrency Exchanges. 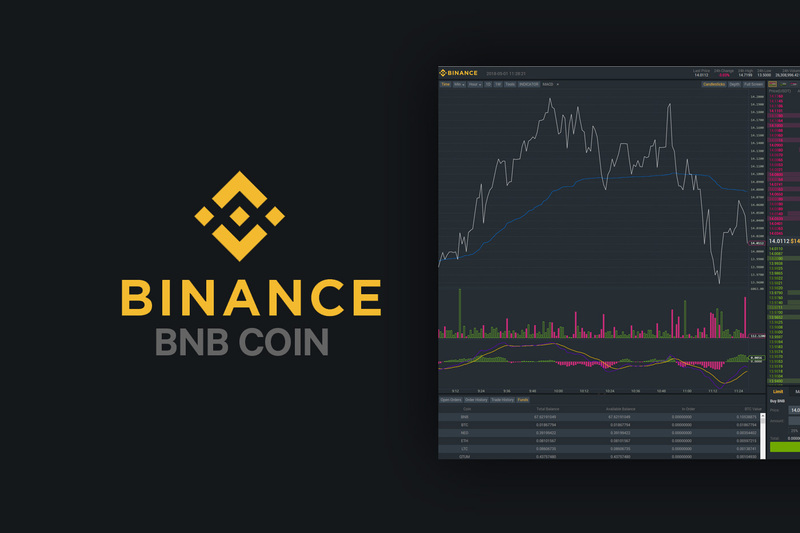 Update, April 2019: We have continued to update this review since Binance was first launched ( we were one of the first to offer a review of the platform at the time ). And as time has progressed, time and time again Binance have proven to be one of the very best, if not the best, exchanges available. Their CEO Changpeng Zhao (CZ for short) has been part of the cryptocurrency community and shown high standards of integrity. Binance the exchange has continued to innovate, bringing new products to market and new options for purchasing and trading cryptocurrencies to all corners of the globe. Daniel Dob is a freelance writer, trader, and digital currency journalist, with over 7 years of writing experience. His main niches are cryptocurrencies, business, fintech, internet marketing, and finance. When he's not writing, you can find him reading, traveling, or taking one of his hobbies to the next level. So i transferred Litecoin to Binance now I cant even log in due to the 2FA . Does anyone know a contact number for them? Made a deposit and now i can’t get in because Binance can’t send me anymore SMS for authentication. Can’t get in touch with Binance for over 3 days now. They keep replying with standard emails,also from the requests. Is my ether gone now? I would wait for a reply from a customer service person, the site is undergoing growing pains with a huge influx of new users at the moment. Same situation Binance shows coin holding deposited into account. I have been trying for several days to withdraw coins to put in wallet. Is therte a settlement period. SMS code will let you sign into account, but when you go to make a withdraw it mysteriously doesn’t work. SMS code they send says good for 30 mins when you receive it. Enter the code and it tells you when you bad tag# or code expired. Trying to do google 2FA sign up is a joke without very good instructions. If your new to Binance “Don’t keep a lot of funds in account”. No email response except general FAQ’s on their website. Make sure you take a screenshot of your holdings, “JUST IN CASE”. Same situation here with me. I have not been able to do any withdraw at all! Furthermore, they have continually ignored all my tickets. There are so many issues with the support that I don’t know where to begin. Binance staff very lacking in English is the heart of the matter and I’m very concerned with this exchange. No, I get it in a few seconds here in India. I can log in ok with their SMS but get an error message when I want to withdraw saying the SMS code is wrong.. Keep away for them and Being based in Malta it is hard to get decent service.. I bought some Ripple on Binance. Does Binance has their own wallet? or Do i need to find another Wallet to store my Ripple? Hi Larry. Like all other exchanges, Binance has it’s own wallet for you whenever you buy any cryptocurrency. Once you buy any cryptocurrency on its exchange, it gets deposited under your Binance account and you can see your holdings under ‘Funds’, then select ‘Balances’. Having said this, it is always advisable that people avoid keeping it on the exchange because it is more secure storing it in your external wallet. Hope this helps. after buy the cytro currency how to transfer to my trezor for cold storage safe ? possible ? Make sure your currency is supported by the wallet, then visit the “deposits withdrawals” link in Binance, find your currency and click the “withdrawal” button and enter the address given by your wallet. Make sure you double-check the address is correct and I would recommend sending a small amount first to check everything’s fine before sending the full amount. are there fees to withdrawing altcoins (i.e. ripple or tron) from Binance and move to wallet? What wallet would you recommend Mr Dale? Also, my other question is if I sell all my coins in binance and don’t want to buy or hold any coins where can I keep my uninvested money? Do not withdrawal directly to a crowdfund or ICO. We will not credit your account with tokens from that sale. You can purchase BTC, Litecoin or Ethereum from Coinbase and then send that to Binance to purchase other currencies. Maybe the price of your chosen currency went up and your order didn’t get filled? You have up to 2BTC per day withdrawal limit without being verified, so you can contact customer support and in the mean-time make sure you stay under that limit and you will be fine. 2 btc/day withdrawal means altcoins worth 2 btc as well? or straight btc? 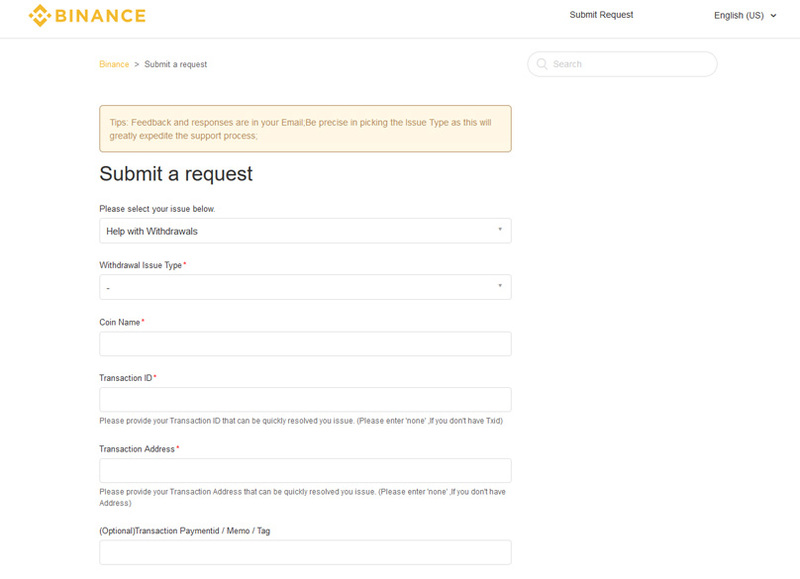 all my wallets in binance don´t open the address field for make a withdrawal but open for deposit .last 3 days i try withdrawal some coins, more them the minimum allowed, and i can´t. how to make a deposit?? i just joined and want to start what do i do with the deposit address?? where do i go ??? In the top menu, hover over “funds” and click the “Deposits Withdrawals” link. Then next to your currency you want to deposit to, click the “Depositi” button and an address will appear for you to send your funds to. I placed an order four hours ago and it’s still sitting in “in orders” any idea how long it should sit before I cancel? Maybe the price of your chosen currency went up and your order didn’t get filled, you can cancel it and place a higher bid or leave it if you think the price will go down. Can I fund Binance using my Revolut account? Or does it have to be a specific wallet? But coinbase isn’t available in every country, is there another way i can buy bitcoin with a debit card? I have an Binance account and would like to fund my account a,s,a,p. Yes, you will need to swap Litecoin for Bitcoin and then trade that for other currencies. Am just wondering if the swapping you mentioned will cost any additional fee? as i do not know if Binance will consider this “swapping” as a trade. Yes, of course when Oliver mentioned “swap” he referred to trade. Sell your LTC and receive BTC, then use the BTC to buy POE. If you buy/exchange crypto on binance for the purpose of holding and not trading, will your crypto move with the market to see profit/loss? What does the “in order” column mean in the the Deposits and Withdrawals (holdings) page? I have x Total Balance of BTC, Y Available Balance, and Z In Order (Z=X-Y). My best guess is it’s waiting for an order to be filled. (I did a bunch and lost track) Other reasoning could be that I had just deposited BTC and it’s waiting for it to clear? I’m annoyed there isnt much of a description for these things on the site. For Binance withdraws, will the same coinbase account that I used to make my deposit appear, or do I need to put in a hard address of my coinable account? Binance is a great platform and I’ve been using it for some time now and have no come by any problems or issues. Its is simple and its fees are reasonable and cheap and for an exchange/wallet it has a decent referral program. Hello please I want to know if there is a minimum deposit in ETH I need to make on binance before I can trade there. Like bittrex you have to deposit minimum of 0.1eth is there such in binance? can i deposit and withdraw XRP to and from Binance XRP wallet without verification ? Binance and Kucoin are the best exchanges right now! I also have good smooth experience in all aspect, trading, fund transfer etc. They are reliable and excellent. have funds on binance new account , i go to the exchange and it says zero fund so i cant buy ? In your desktop client, there is no pricing in reference to a candle on the chart, only in trading book. Is there a way to turn it on just like on the web app? Should be pretty standard, cant attach .png .jpg for better illustration. Can i deposit BTC through my e wallet over to Binance and then swap into XRP? Or must you have to go through Coinbase? I just opened a Binance account. Tried to transfer ETH from GDAX. When I click on Deposit in Binance, I am not getting the ETH address. Do I need to complete my verification to get the adress? what does mean Coins will be deposited immediately after 30 network confirmation? i transfer some ETH to Binance from Coinbase but hasn’t come. Binance or Kucoin are my current favourites. I´m trying to get a level 2 withdrawal limit, however my application was rejected due to the cover of my passport being faded. I take it everything else was fine, but since I use my passport quite a lot, it has faded over time. You can still make out the logo, but it has lost the golden ink. What can I do? I’m trading at Binance for some weeks now and i’m satisfied with this platform. So far i thought that the FIFO method comes in place if i’m selling coins (e.g. bought 3 times 300 pcs. each at different prices on diff. dates, if i sell later on 300 pcs. the first bought ones will be sold). But today somebody told me it could be that they pick up the average price of all 900 pcs. Do you know how Binance operates? And, do you have a suggestion for a similar software solution to Cointracking.info (having API problems again and again)? It’s a complicated issue for sure, you didn’t mention where you are based so the laws differ. The best thing is to seek advice from an accountant – something I’m also doing at the moment. They suggest to buy BNB to pay fees but there is a problem, BNB now is very expensive and you aren’t allowed to buy a small quantity. This problem is called Binance’s problem with decimals, it also affects other coins. If you have a small remaining you can’t trade it. Another problem, there is no window to see your profits. How can I know Binanace add new crypto ? Check the news by clicking the tab on top line. Does binance allow usd to be deposited , or allow coins to redemended for usd and withdrawn? How can I use binance api for automated trading on Tab Trader? Oliver Dale you seem very knowledgeable of this site. Signed up but I can’t figure out how to add money. Can you help me. Nice try with the ninja-referral link. But no, you can NOT register for a new account on Binance at this time. Binance is now accepting new applicants. I’m a beginner into crypto and have a question, is some can answer please. Can Binance be at risk since it’s a Chinese exchange and the Chinese government is after crypto? Binance bans Chinese resident access to cooperate Chinese government but do not pose any issue on other countries. I think they try to settle down outside China, but not sure of latest status. After a trade where I bought some currency (let’s say XRP) using BTC, I try to sell everything of that currency (XRP) to retrieve BTCs. However, there is always some of that currency left in that currency wallet. If I try to buy BTCs with them, it says:”Order failed: Insufficient balance”. So my money starts to spread across many wallets (Very small chunks that I cannot move from these wallets). Is there a way to avoid that? Binance is on of the best exchange. Fee are realy low, only 0.050%. Site is fast and it’s easy to buy and sell coins. You don’t need any documents to first step of identification so you can withdraw 2 bitcoin every 24h. Every thing is clear for me but how I know how much I earn & lose per coin? Is there any way to see profits and losses on particular trades in Binance or do i have to do it manually? I activated the touch in option on my phone and my phone does not support the fingerprint touch in how do I get that off so I can get into my app? I’d like to know how much is the minimum deposit in every coins in binance? I have been in confusion for many days, once I transferred my but coins into binance, I could start trading right? So, suppose I have bought 1000 ripple coins and I sold them and made 20% profit, my balance converted to bit coin again right… What’s bitcoin value decreases 20% right at the same time,?? Here did I made profit or incurred loss?? Just bought some fun fair , about 160 units , and withdrawal costs me 143 . My wallet recieved only 17 units . Is that normal fee or i missed something ? By the way i’m noob . Run, don’t walk, away from this exchange. There is *no* customer service available and no way to reach it if there were. There is no way to close or delete your account. Once you have given them your information, you are stuck. So, Binance, Robin Hood, Changelly…all relatively low fees to exchange crypto for crypto, but who has the lowest fees on exchanging the crypto into USD? And…after you exchange it for USD, who has the lower transfer fees to get the USD from my coin exchange into my BANK account?? Would appreciate a reply, and if you could either supply the answers to BOTH questions (the one for fees from crypto to USD and for moving the USD to the bank), OR copy and paste links to the places the information can be found on each exchange. It is great that Binance only charges 0.1% for conversion from crypto to crypto but I can’t find a fee schedule on Binance, Changelly, or Robin Hood that tells me how much it costs to convert the crypto into USD, and then their fees for transfer to a external bank account. I can’t imagine Binance offers the same VERY low rate on transfer to a bank as they do on crypto to crypto exchange. I assume part of their justification at all of these companies for offering such LOW fees for crypto to crypto exchange is because it keeps your assets IN HOUSE and then, in theory, more likely to leave your currency where it is because they’re the lowest on conversion fees. For example, Binance is a China run, China based company. Using them because of the 0.1% fee seems great in the beginning but once that is converted from crypto to USD, it sure as hell isn’t going to be FREE for someone to move their money from China to the US. International bank transfers usually carry a pretty hefty cost. For that reason alone, unless I see something in writing on what that scenario would cost me from start to finish (crypto to crypto, then crypto to USD, then move USD to my bank) for each of these crypto to crypto companies….I won’t be using any of them. The only reason I am asking is because I spent quite a long time researching all of these things and I can’t find those answers from those 3 very popular exchanges anywhere on their own websites or elsewhere on the internet. These 3 are fairly large entities, and popular with consumers. You’d think they’d skip the cliche snake oil peddling, company biased fine print loopholes that ALWAYS exist, and leave no question hanging with a vague description that truly doesn’t commit them to any promise to the consumer using their product. If they aren’t big enough to be able to state all of those fees up front in an easily understood, and easily FOUND fashion these exchanges are worthless. People will get hardware wallets and hold onto it until they DIE before they let everything they’ve bought or mined get pilfered over and over off of the top from one exchange to the next and one transfer to another holding. I’ve read so many nightmare stories about money not showing up, money disappearing, money simply STUCK because of minimum transfer amounts that companies have set, and….finding out the hard way that the app or software they used to mine was malware and as soon as they transfer it to what they thought was their coin wallet turned out the money was jacked and put into an account by the app creator and their cohorts. Never a day goes by without one of those reviews landing on their app in Google Play or on their actual business website as feedback posts. Crypto will get outlawed if these companies and app creators don’t stop fleecing people. America’s credit consumer council will push Congress to outlaw it if too many people invest MILLIONS by buying Bit or Eth, and moving it….then losing it ALL. Fraud. That would be a case of fraud and they don’t like crypto to begin with. There are 5 countries that crypto is illegal in. I wouldn’t doubt that in another year’s time that list will grow if LEGIT crypto outfits don’t start doing something to warn consumers and steer them in the direction of companies that won’t rob them blind. It is in ALL of their best interests to not just promote themselves but also to promote their fiercest competitors. If they can use the word compete in reference to someone else’s company, that means they are viable enough to be competition to everyone that is in par with them or knows damn well their competitor has integrity and is worthwhile for a consumer to use; they should be recommending them to keep consumers SAFE and IN the market as best as they can. As I understood, Binance is a quite new cryptocurrency exchange? There are so many new coins that are streaming into the market and then there are all these new cryptocurrency exchanges coming too. How do you know which one is trustworthy or not? Wow! Great post on Binance. Very helpful for those looking to invest in cryptocurrency. Make sure when you enable 2FA authenicator that you copy secret key in case you lose your phone with the authenicator app active.If not they will not deactivate authenicator on your account unless you know several security protocol and be exact! OR you will never see your money again not even if you show them a picture,driver license of yourself,They make it impossible .Only what they ask you which is bad news and not right in my opinion,I use Coinbase and Bittrex exchanges also they are more people customer friendly.And know how to still manage security and help customers not lose their hard earned money.But Binance exchange is hard and cruel BE WARNED THIS IS NOT A JOKE.they are moving to MALTA from China BE WARNED……. If I buy ripple now in Binance and just hold it until its price goes up and not trade it…is it possible in Binance? Would it be possible to deposit funds directly into Binance 2nd week of November 2018 & purchase bitcoin at Binance ? What offramp can you recommend ? If you are looking for an exchange which is good to buy Bitcoin online and then trade it on Binance, Linkkoin is pretty good. Oh and remember to verify yourself, this s obligatory if you want to send your crypto to Binance. Please don’t transfer or buy any type of fund in Binance go for the Coinbase or Kraken. Actually , i change my number and now Binance asking lot of question to reset my SMS and from myside fulfilled with maximum answer with screenshot , that no one can remember and opposite side Coinbase and Kraken changed it in one day with one security question. Still i am fighting for that. So i have bad experience with Binance.